Setting mail account for Subscription of scheduled Jobs in JasperServer. I wanted to document the process from a long time but due to crunch of time I could not, but now I will like to explain the process in simple easy to follow steps. First of all I would like to give an idea to problem addressed in the blog, basically when a report runs as a daily status or daily count one need not run it manually it could be scheduled, but when the report is scheduled the export in desired form is exported on jasper server. But wait a minute do we really login and see what the results came as in the PDF, Excel etc. export, no we need not the problem is handled by mail subscription attached to the scheduler, which will automatically send the Exports to the subscribers on their email accounts and send a confirmation to the administrator. So lets cut the explanation and lets jump directly into how to do. 4. Shut down the jasper server so that no sort of errors come in case of Editing/Saving documents. after following the above prerequisites now we head on to edit two files as follows. - Make the changes and save the file. - Do the changes as below - This will enable java to interact the smtp/startls authentication. - Now save the document. Now the report subscription is ready for run, just start the Jasper Server and you are good to go. 2. Enter the username and password. 5. Open the WinSCP, and key in the IP Address as well as the credentials and set the Protocol as SFTP . 7. Drag and drop the folder created earlier to the local machine. 1. Open the WinSCP, and key in the IP Address as well as the credentials and set the Protocol as SFTP . 3. Drag and drop the folder downloaded with the report. 5. Enter the username and password. I have been thinking to compile a document which outlines the complete process of installation and setup of the connection because generally when one starts they do not find much of material and they tend to get stuck on a trivial issue. So the post will have two portions, namely Installation and Setup. This document will apprise you with the basic installation software, which would act as a prerequisite to run Jasper Report. This is a third party Jasper Report designing software. iReport is the most popular visual designer tool for JasperReports Library and JasperReports Server (Business Intelligence). The software can be downloaded in an exe run able format for windows machine, or other types of files as per the platform demands. Below is the link from where the file could be downloaded. 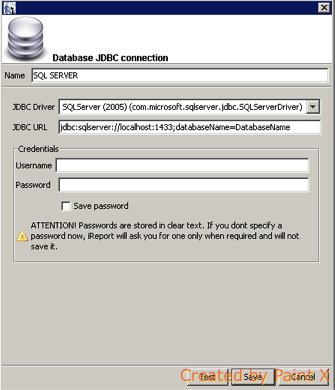 The database server or the datasource which serves the purpose of feeding data to the report, in this projects case the setup was in the SQL Server 2008, which could vary from project to project . Below are the steps for the setup, which would act as a prerequisite to run Jasper Report. Download and install java 7, please do mind not to install Java 8 as it is yet not supported by iReport. iv. Now test the connection, it will say the connection successful. We are now ready to create reports. Enter the details below, for the connector and setup the datasource. The above steps are pretty basic and gives a fair idea as to what all basic necessities are there to process the installation and setup. This Exception comes generally when you try to export the report on Jasper Server in PDF Format, or from iReport, then due to the error in some of the image or all the images, which is producing the error. Jasper Reports Server is basically a stand alone as well as embedded reporting server which can be easily used for deploying the Jasper Reports. It provides a way to embed reports as well as analytics into a web or mobile application, as well as act a informational hub. Server is made to securely share and manage the Jasper reports and analytic views. 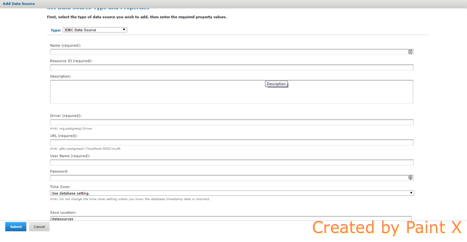 The security feature is implemented via role management and user creation facility in Jasper Server. 2. Embed into services, or applications. What benefits do Source Code Management tools provide? Collaboration: SCM tools prevent one user from accidentally overwriting the changes of another, allowing many developers to work on the same code without stepping one each other's toes. History: SCM tools track the complete development history of the software, including the exact changes which have occurred between releases and who made those changes. Release notes generation: Given the tracking of each change, the SCM can be used to generate notes for their software releases which accurately capture all of the changes included in the new release. Documentation and test management: SCM tools can be used to manage not just software source code, but also test suites and documentation for their software. Change notifications: To keep interested members of the team informed when changes occur to the source code. Project developers who are writing source code. Project testers who need to download the very latest changes. Advanced users who want to try out code that is not yet stable, mature or released. In JasperServer, the SCM is managed very intelligently, whenever you draw a report for viewing in then you always get a version of the report, so you are not really modifying what is there on server. Jasper Server always keeps the original content on the server and provides the user with an instance of the report which is directly stored in the Temp folder, and if you need the modified version you have created as the current version then you need to replace the report with the current version of the report, by right clicking on the report in the repository and then replacing the report. In light of this feature there is also a extreme care to be taken that which version is being replaced, because if once replaced the version of the report will be changes and it would be not possible to roll back the change. This feature is really very great when you need to work on the small modification in the report as you can draw a copy on the local system and work onto that until you get the desired modification as well as you can simultaneously compare the previous version of the report and if you get the desired changes executed you can replace the report and have a new version of the report. Hope this information helps you a lot!! 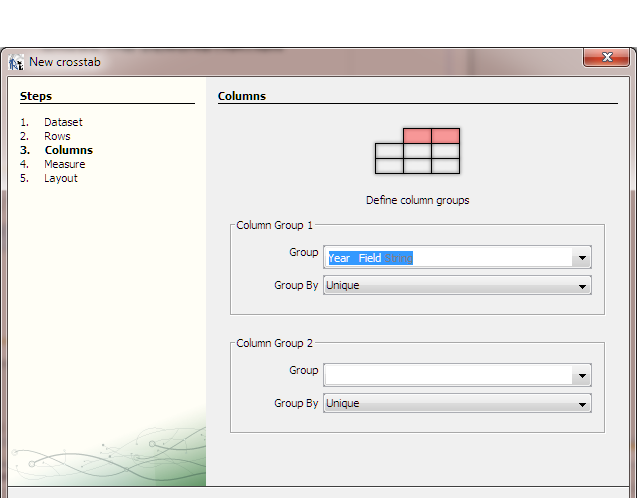 CrossTabs are used for creating statistical view of a large sample data. They allow you to summarize a huge unorganized data to be organized in terms of commons between the data. Now if you have to tell the total sales of Audi in 2000,2001,2002. It will be a long and tedious process, so to show it Schematically We can have Distinct Years and Distinct Car Brand Names for representing the data as they are the are the common attribute to the data . In the table above you could easily determine the Number of car sold for either of the brands and in which specific year. Also The last column where the the two totals converge i.e. 16 shows you the total value of the sample. Now let me quickly move on to implementation of Cross Tab in Jasper Reports rather iReport. 2. For the demonstration purposes I will be using the Excel File as the datasource. 3. 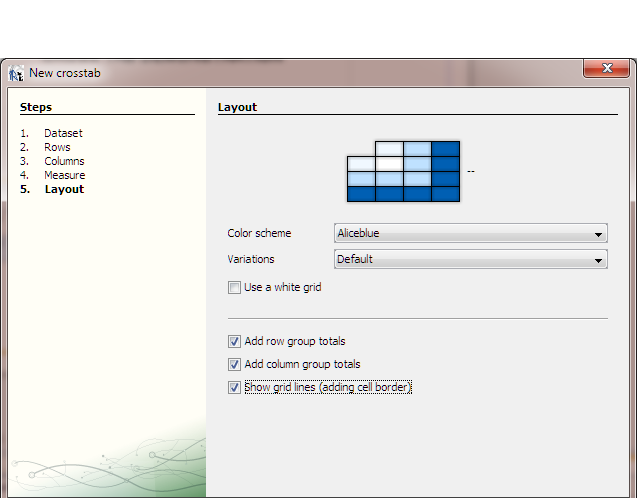 After defining the datasource, we need to add the CrossTab element from the pallete. 4. Pallete could be accessed, Window( Menu Bar) --> Pallete, then from there the CrossTab could be found under the Report Elements. 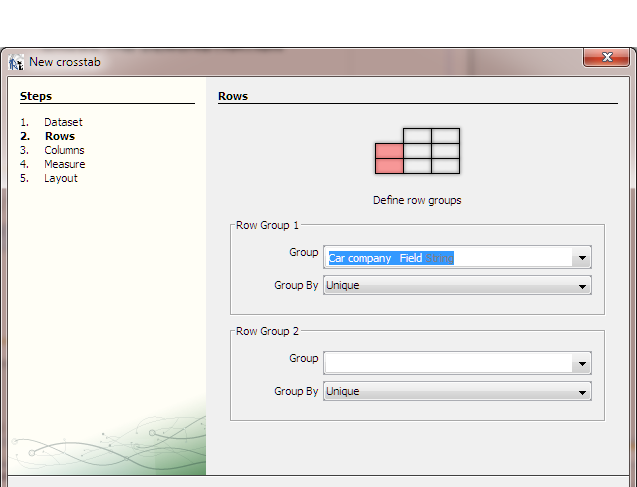 Next will appear the grouping criteria for the rows which in short means that which field(s) will come on the Rows of the Cross Tab. 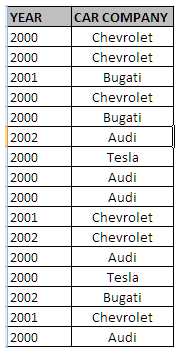 We need the car companies on as the rows which are unique. Next will be the Measure or the count of the value in particular grid. Then will come the window to select the layout of the crosstab, this means here we can customize the looks of the cross tab by defining the colors and which columns to show/hide. 6. Now this brings to the completion of the crosstab, now we could see that a tab at the bottom left corner appeared showing the name of the Crosstab, as Crosstab 1. There we could see the columns and design of the Crosstab. 7. Now a very critical point is placement of the crosstab, this should be really placed in a report band wherein the data is calculated already and then is to be shown in crosstab, the most favorable band to show the CrossTab is Summary band, else it will throw an Error Incrementing crosstab dataset/ Crosstab already been processed. What "Crosstab data has already been processed" exception means? This exception is thrown if more data is added to the crosstab dataset after the crosstab has already been rendered. This usually happens when a crosstab element is linked to the main dataset of the report (does not use a subdataset run) and the resetType attribute of the crosstab dataset does not match the place where the crosstab is rendered. Crosstabs are special components that display aggregated data. And when they are linked to the main dataset of the report, you simply cannot put them in the detail section, because there is no data to aggregate from a single record. Such crosstabs could only reside on a group footer or on the summary section of the report and have the appropriate resetType value, so that their dataset is initialized each time after they are rendered. If you still think you need to render one crosstab for each detail in the master document, then almost certainly this crosstab should be linked to a subdataset and not to the main dataset of the report. Download the tutorial JRXML here. 1. Unzip the file downloaded from the above link. 4. Then open the sample report and its ready to run. We have been accustomed to use style sheets or CSS in our HTML codes, parallel to that we can use Styles in Jasper Reports also. It provides same utilities like conditional, non -conditional and could be applied on any element in the Report. 2. Declaring Internal Styles in the report itself. The advantages of using external Style sheet is that it provides modularity and re-usability of the style over large number of reports using similar kind of styles. On the other hand, Internal styles would only contains the styles definitions for a particular report. How to apply styles in the reports(iReport). 1. Locate the Styles node in the Report Inspector. 4. You could even click on the Style and add a conditional Style and define conditional styles, like alternate coloring and much more. 5. After defining the styles now in the application part, locate the element onto which you want to apply the style. 6. Select the particular style in the property called Style(could be found in the properties pane) of the Element. The Sample uses the Sample database so no need to worry about the datasource. Many a times we require the name of the person who logged into the Jasper Server and according to this information we are able to show/hide the elements on report, or simpley to log the user name we can use it. So how to achieve this ? We can create parameters in our report, with a specific name and datatype. 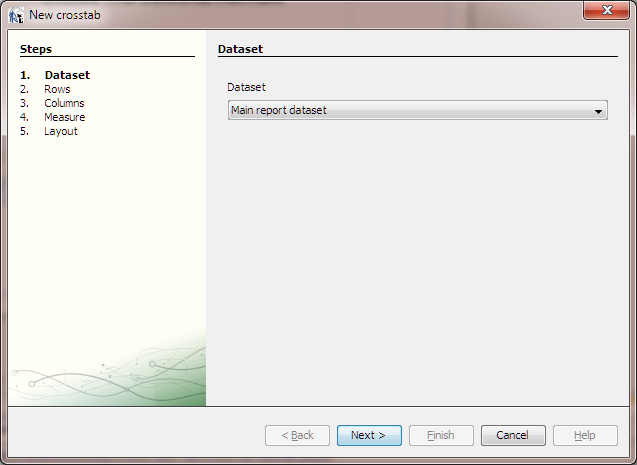 Then these parameters will be automatically filled when the report is executed by JasperReports Server. This is a built in parameter which gets filled with the User Details when report is run on Jasper Server. Note that the report if run in iReport, would get a null value. So for the correct results it is necessary that we deploy the report onto JasperServer. Is logged in user enabled? Is logged in user externally defined? Current set of roles of logged in user. used as parameter to report. Attribute value for matched attribute name (like "att1") on the user. Empty string if no match. Only provided if defined in a query or as a report parameter. Using the above parameters we could easily get various important information which could help in defining the roles. I’ve been working with Infor PM OLAP Server for almost four years now, I knew it when it was known as MIS Alea, before Infor took over MIS AG. It is one of those products you don’t select, a client has it and you have to work with it. I’ve always used Infor products, like Infor Office Plus and Infor Application Studio, in order to access to this OLAP database, but, last week, I tried to do it using my favourite reporting platform: JasperReports Server, so I’d like to share my findings. First of all, i’d like to point out that Jaspersoft hasn’t certified this OLAP DB as a source of data. It is obvious, but I must say that I just want to tell you my experience, so I am not responsible for any misfunction caused, if you try to do what I did. Infor PM OLAP Server (10.1.7 version, in my case) is tightly coupled to Microsoft Windows. Therefore, the interaction with JasperReports has to run through a standard, in this case XML for Analysis (XMLA). It is difficult to find information about Infor PM OLAP products on the Internet, so I relied on the documentation of the DVD which has the software, specially the “Provider for Infor PM OLAP” manual. net.sf.jasperreports.engine.JRRuntimeException: Could not find dimension "MONTH" on axis 1. Once I compiled and changed the file on iReport, I could run the report properly. It was exasperating! According to this forum post, the cause rely on the JVM, so I adapted me to the circumstances and revert the first change I made on the source code (“\”urn:schemas-microsoft-com:xml-analysis:Execute\””). I know have two different versions of the file jasperreports-5.2.0.jar: one for iReport and one for JasperServer.